It can be suitable water injection, fluids, detergent products of different viscosity. It is widely applied for filling products in such industries as food, cosmetics, medicine, grease, daily chemical industry, detergent, pesticide, chemical industry, etc. It can be used for filling different types of solutions without the need of adding any additional parts. ● It intergrating photoelectric sensing, automatic compensating and pnematic actuating. 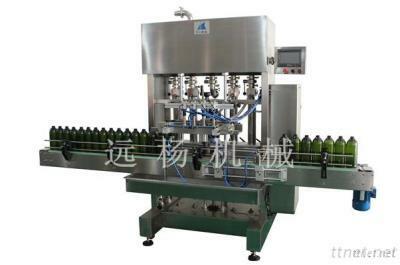 ● The two-row filling system can fill different liquids simultaneously. ● It provides the function of submersible filling without foaming during the filling with accurate measurement.